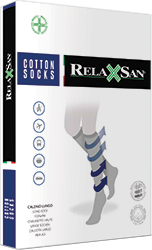 RelaxSan Cotton Socks is a line of cotton socks unisex and for manh with a graduated compression, for the prevention and the treatment of problems relating to legs blood circulation. 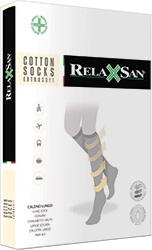 RelaxSan items are produced with yarns of very high quality, to guarantee a long duration and have an anallergic action at skin contact. 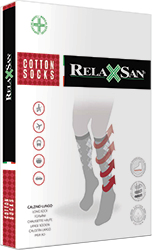 RelaxSan Cotton Socks items, thanks to their graduated compression, are recommended for people who make a sedentary work and travel frequently.